It’s only one more week of work till Christmas, get hype! Perhaps the geeky activity might die down as we get closer to the best time of the year, but for now, here’s what we’ve been up to in the last 7 days. So, I couldn’t help but hear about some game, PlayerUnknown’s Battlegrounds? Or something like that. Well anyways, I’m personally not a PC gamer, I prefer console gaming comforts. And I don’t have an Xbox One, and this far into the generation with their little output compared to Sony’s output, have no intention on rectifying that either. So I’m not likely to play PUBG until it eventually comes to PS4, which based on some comments after E3, is going to happen eventually. So in the mean time, to scratch the itch that is curiosity of PUBG, I downloaded Fortnite for PS4 as the Battle Royal mode is completely free to play with no need to own the original game. How crazy? Well first few games I played, I had no idea what I was doing to be honest, my best finish was 61st. There were people building things, people with guns, and I’m running around with an axe and no idea where to find guns. But the more games I played the more it made sense. On my last play of the game yesterday evening, I ended up 3rd, which I thought was pretty damn good considering it was only my 7th game. The final moments of the game where I did place 3rd were incredibly tense. I was playing it with 2 friends over who were equally as tense for me. It appears it might have sold one of them on the game as they’ve since downloaded it too, and we’re intending to get a few sessions together on it. I’m thinking I’ll play it some more, but I’m still more likely to boot up Call of Duty I feel over this. I’m not sure what I expected really, I can definitely see the appeal to this game mode though, and can see why it’d be easy to become addicted to it. So once again, it was another Saturday with beer and rum. This time it wasn’t as heavy, and finished no where near as late as our previous play of this, so we were a little cautious of playing this game again as we were sure we’d not have the same laughs this time round as we did previously. Well that was silly to think that. Comparably sober to the previous time we were still in absolute stitches playing this game with plenty of not safe for work images drawn and not safe for life comments wrote down. The “iWatch” comment in particular was hilarious, but I can’t post that screenshot here for reasons. Sony are really onto something with this Link Play method and games like this. While playing it with the family would be a damn sight more contained than our plays of it, it’d still be good fun I feel. Sony should really be pushing this during the festive period as it’s that time of the year where the family are all together. I’m considering taking the PS4 to my parents house on Boxing day when we have all the family over to play this together, It could produce some proper crying with laughter moment’s I feel. So I’ll leave you with probably the only safe picture of the night, which at the time was still funny as hell. I signed up to this month’s Humble Bundle mainly because it had Quantum Break with it and I’d had my eye on it for a little while, I almost bought it during the most recent steam sale and now I’m glad I didn’t. 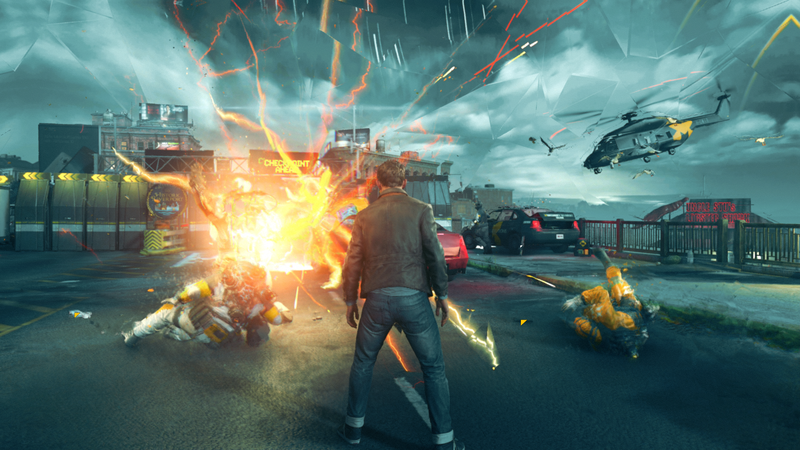 Quantum Break is a sci-fi action adventure game with a hell of a lot of time manipulation. 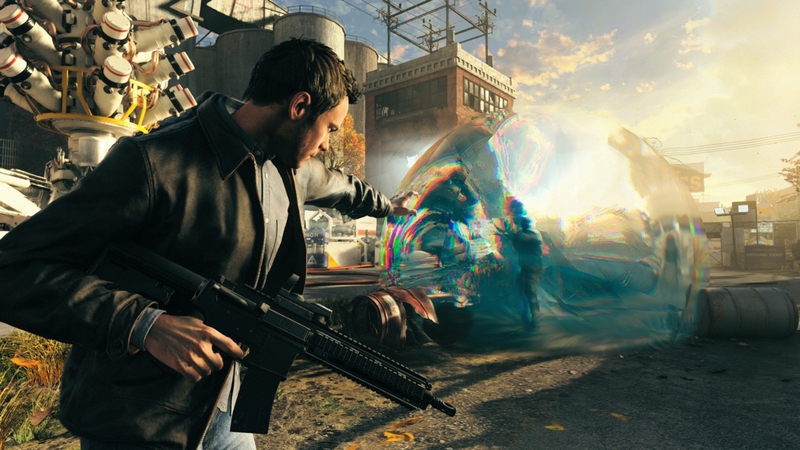 What’s unique about Quantum Break is that there was a live action show that ran along side the game providing you with extra back story and meat around the games main plot. Time is about to stop completely after an experiment for time travel goes a bit awry, slowly time is breaking down and fractures are causing time to freeze, but it’s ok because you play as Jack who was at the scene of the failed experiment and it seems that the break of time has had an unexpected side effect of you and you can now control little bits of time. You can stop it, run really fast, create little bubbles where time stands still, rewind bits. It’s pretty cool to be honest. But, stories with time travel always baffle me simply because of time paradox’s. For example, at one point you’re talking with the main bad dude and he tells you to come to a specific meeting, you kind of argue back being all skeptical but he says something along the lines of “I know your going to come, I’ve already seen it.”, basically saying he’s seen that part of time and knows you’ll be there, but would you only be there because of that conversation? Would you still go if you hadn’t spoken to him? Do you even have a choice? It’s these little loops that, when you think about them, really boggle me. Aside from that the gameplay is actually really good fun so far, there are some really great set piece moments where the time fractures create amazing visual scenes with objects collapsing over and over like a glitch. The addition of a show on the side is an interesting one and I’m still not 100% sure how I feel about it. It breaks up the gameplay a bit when you just start a chapter and want to play for a 10-15 minute live action scene to play. At times, all I wanted was to get on with playing. I’ve also been playing Fornite, but unlike Murr I’ve been playing it for a little while now and really enjoying it. Personally I don’t think it’s that comparable to PUBG, yes, they’re both Battle Royale games, but they both play so differently. PUBG is a lot more tactical, where as Fortnite is a bit more fun, it doesn’t take itself too seriously and it’s a nice change of pace to PUBG. Fortnite recently added in a 50 vs 50 game mode and I have to say it’s a hell of a lot of fun. It’s basically mayhem and whether you win or lose it kind of down to luck of the draw and where you drop, because you might be the only person on one team to drop at a certain location where you could have 30 enemies. I put together a video of a couple of fun games I had whilst playing! Check it out!